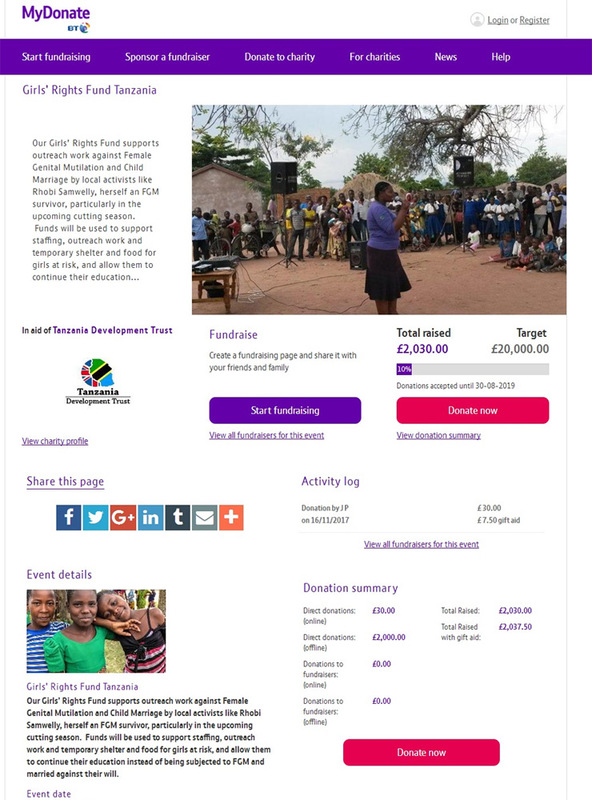 Tanzania Development Trust has launched a new MyDonate page to raise money for our Girls’ Rights Fund. Between 2014 and 2017, TDT worked with ACT Diocese of Mara to construct a Safe House for girls fleeing FGM (Female Genital Mutilation). TDT was asked to raise funds for the construction of the Safe House, upon which its operation would pass to the Diocese. Overwhelming support from donors saw the Safe House officially opened in February 2015. Most of the buildings were completed in 2016, and a Toyota Land Cruiser purchased. In three cutting seasons, up to 500 girls were directly saved from FGM, and others by outreach work in villages. But since the appointment of a new Bishop of Mara in August 2016, TDT has become concerned about aspects of the management of the Safe House, and less apparent commitment to combatting FGM. Since then Rhobi Samwelly, the charismatic Director of the Safe House, has ceased to be employed by the diocese. It is hoped that, in time, agreement can be reached on the operation of the Safe House; until then, however, TDT is not sending money to the original Safe House in Mugumu. However, TDT feels it important to provide donors the continued opportunity to contribute to the fight against FGM and the wider campaign against forced early marriage and gender based violence (GBV). Hence the launch of our Girls’ Rights Fund and the new page on MyDonate. Our Girls’ Rights Fund will support outreach work against Female Genital Mutilation and Child Marriage. We shall support local activists like Rhobi Samwelly, herself an FGM survivor, and the driving force behind the Mara Safe House. Funds may be used to support staffing, outreach work, and temporary shelter and food for girls at risk, and allow them to continue their education instead of being subjected to FGM and married against their will. Projects will be invited to apply to TDT. They will be judged by a dedicated sub-Committee on their merits and likely effectiveness, and in light of funds available. MyDonate was set up by BT in 2011. The service passes on 100% of all donations, only deducting credit/debit card charges for each donation at cost (typically a few pence for a debit card transaction). It will collect and pass on Gift Aid where requested. Donors living outside the UK can make donations using BT MyDonate although Gift Aid can be claimed only on the charity’s behalf for UK taxpayers. MyDonate is therefore an ideal companion for TDT, as our proud boast is that, as a volunteer organisation, 100% of all donations is passed on to projects in Tanzania. Why not create your own Fundraising Event?